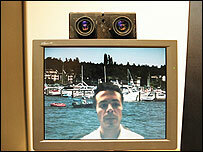 Instant messaging could get a lot more interesting if webcam technology from Microsoft gets the go-ahead. 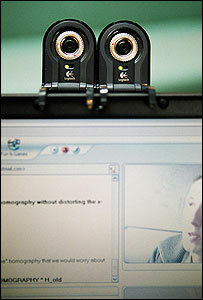 i2i, in development at Microsoft's research lab in Cambridge, UK, is a two-camera system which very carefully follows an individual's movement. 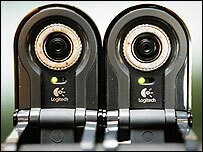 It uses a specially developed algorithm to fuse what each camera sees to create an accurate stereo "cyclopean" image. This means it looks as if users are looking each other in the eye. It can also display floating 3D emoticons. "We were able to come up with an algorithm that was able to take two images and capture a corresponding map in 3D," said Antonio Criminisi, lead researcher of Microsoft's Machine Learning and Perception Group. "Using this powerful technology, we can now synthetically create an image as if the person is looking at you." Recent research has revealed that more than 18.5 million people are using webcams while they use instant messaging (IM), according to Microsoft. Users range from teenagers talking about homework to groups in a corporate environment. But the problem has always been that users appear to be looking at something other than the person they are chatting with. Even though it all sounds like a lot of fun, Dr Criminisi insists his group is primarily about solving "bigger scientific issues". The biggest challenge for the researchers was working out how the visual brain works; how it sorts out colours, distances and shapes, and then creates models of what the eye sees. Essentially, what the researchers have done, according to Dr Criminisi, is replace the human eyes with cameras, and the brain with a computer. The stereo algorithm created by the researchers, which lies behind the technology, makes it possible to reconstruct 3D geometry in real-time and accurately on a standard computer. It is the same kind of technology used to recreate 3D images of the surface of Mars which were sent back from the US space agency rovers. The i2i system can also generate realistic background images so that users can pretend they are somewhere else. "This is important for privacy, because I might not want you to see how messy my bedroom is," he said. Another innovative feature which is sure to grab the teenage market is the "smarticons" created for the system. Instead of typing emoticons - pictorial expressions like happy or sad faces - i2i can superimpose floating, 3D ones. A user can have a beating heart float around their head, for instance, or an idea light bulb. The ability for a camera to be able to discriminate foreground and background images is key when it comes to the way the cameras recreate 3D geometry. But it is in the corporate context which Dr Criminisi sees the i2i being extremely useful, as well as entertaining. Its tracking ability, called smart framing, and its smart focusing capability, could enhance the video conferencing experience. "This kind of research has been going on in the machine vision community for a number of years, but this kind of result has not been produced with such accuracy before," said Dr Criminisi. "It is important for video conferencing applications because the system can automatically detect what is important in the scene," he added. There are still some issues to be ironed out - such as processing power - before it is taken to the product development group at Microsoft, but, said Dr Criminisi, a great deal had been achieved in under two years. "Many things are out of our control," he said, "but we are talking about to what extent we can make this happen." Right now, the technology is just in its infant stages. The group is already exploring the potential for users to create their own wrap-around avatar-like 3D faces, or masks, which can move with them and appear real. This kind of application could prove a massive hit with the gaming community. With Microsoft's MSN IM program as well as Yahoo Messenger and AOL Aim currently dominating messaging applications on the web, this kind of technology may not be too far off. Webwise: How do I instant message? Webwise: How do I use a webcam?